All our company employees play an important and decisive part in its success. We encourage personal initiative.. Main motive is success in all levels of company's structure. We want our values to characterize our way of doing business. To achieve our aim, all our employess are being appointed,, trained and get rewarded according to these values. Basic product characteristics are traditional taste and production techniques as well as high nutritional value and quality. We always face our sector's challenges looking for innovative ways to improve our products and services. Our aim is to provide our clients with the highest possible level of service and product quality, neverforgetting that this is the main key to our success. Flexibility, innovative way of doing business and experience, lead to the creation of strong bonds with our clients. The selection of our suppliers always happen with strict quality standards criteria, These include certified quality according to our requirements, insured long term coverage of our needs and local geographic characteristics. Chairman of board of directors. Our extensive communication with consumers and the recognition of our products high quality, led to the decision to invest on new innovative products of higher quality, assurance and nutritional value. Since 2004, company’s R&D department started to focus on the development of bio-functional products. HHBT (“Hellenic Hepirus BioTechnology”) was being founded, a company that specializes on Bio-Technology Research and Development in cooperation with prominent biologists. On February 2011, this research led to the company’s second patent concerning a solution of Krokus Kozanis with Extra Virgin Olive Oil. This solution not only amplifies the Extra Virgin Olive Oil’s healthy properties but adds a lot of the pharmaceutical properties of Krokus Kozani. Using this solution, the new patented “Pitenis Premium Quality” line was being created, consisting of 7 Dips, 3 dressings and a Bio-Functional Extra Virgin Olive Oil with Krokus. Finally, the addition of Extra Virgin Olive Oil in almost all “shelf” company’s products, distinguishes them from competition and makes them more attractive to the modern consumer not only in Greece but also abroad. Exports play the main role on the organizational culture of the company. Year by year, the company builds a very strong exporting profile. 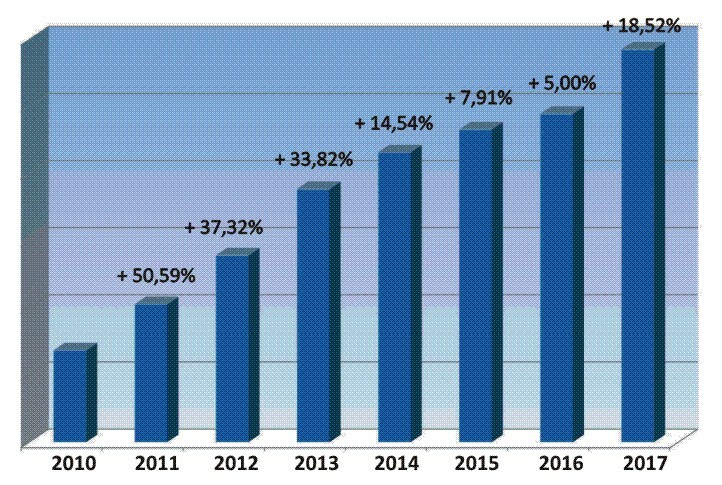 Export sales extend from European Union countries to USA and MENA Region (Arab countries), with an always increasing rate, since 2004, peaking at years 2010-2017, as show in the diagram. Capturing market's messages fast and at their early stages, Pitenis family invested on the combination high quality - traditional taste, using the most modern production techniques, achieving International certifications (ISO 22000:2005, HAACP, BRC, IFS, HALAL, FDA), and utilizing pure raw materials, 97% of which come from the Greek land. Raw materials are being examined in our Laboratory before being accepted in the production process, ensuring their quality, specifications accordance and their suitability. It must be noted that a remarkable quantity of raw materials every year is being denied and returned to the supplier. Our efforts are being focused on substituting chemical substances and additives, which are broadly used in industrial Food production, with natural - healthy materials. Since 2005, the company implements a plan of cooperating with employees for the production of farming raw materials. These materials are being farmed on their land with company's control, aiming at absolutely safe products that abide with company's specifications. In the same direction (part of company's social policy), there were agreements that were being made with three farmer groups from West Macedonia Greece district (Kozani, Neapoli, Grevena) with the sole purpose of completely absorbing their farming production. The control expanded, in cooperation with certified local laboratories, to the examining of pesticides persistence and in the near future the certification of the farming land that is being used is planned. The highly skilled workforce is the company's main strength. The organizational chart includes apart from the Production, Finance, Sales, Storage departments etc., an Exports department, a Marketing department, a certified Chemic Lab and a separate R&D department for the continuous improvement of the existing products and the development of new lines.